The Endowment Fund was established in 1995 to preserve Riverside House for future generations and build the financial foundation needed to continue meeting the needs of the community. 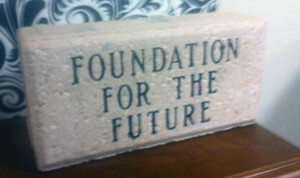 To be part of the Foundation for the Future, reserve your brick today! Bricks are displayed at the Park Street entry to the Riverside House. Each brick may contain three lines of text and thirteen characters per line (spaces, dashes, commas, etc. count as one character).